A late summer visit to the spectacular Noordhoek Beach on Cape Town’s Atlantic coast, for a walk with the dog, produced an unexpected bonus. We saw a photographer with a long telephoto lens staring out to sea for ages and wondered what he was trying to photograph. After much searching we spotted a large school of dolphins frolicking in the bay. Out came the Cannon camera. Thank goodness for its built in 12 times optical zoom, a very effective image stabiliser and a convenient large rock to lean against. 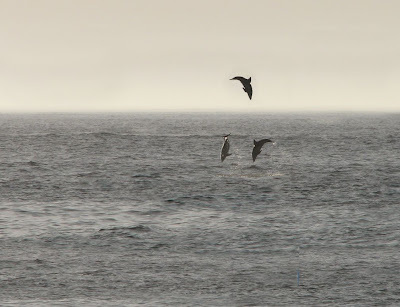 Even with these aids capturing the fast moving Dolphins was challenging! At full zoom your field of view is tiny and the Dolphins unpredictable. Hi...i love you photo of Noordhoek beach. 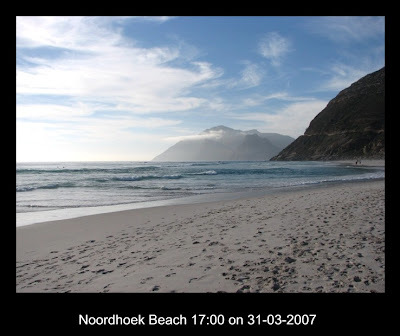 I'm wanting to paint a picture for my boyfriend of noordhoek - is there ANY chance I could get a copy of this photo in high pixel! I've been looking everywhere for one like yours.